This is a private location in a rural setting with views of every mountain in northern New Mexico. The yurt is exquisitely constructed using Kentucky yellow pine. Wide open feeling with lots of light from 4 windows and 2 doors. Kitchen with stove top, microwave, refrigerator and sink. Bathroom with composting toilet and shower. 15 minute to Santa Fe plaza and 5 minutes to mall and shopping. Get to know llamas close up and even take a walk with them. Renters will receive 4 free passes to Friday night roller skating at Rockin' Rollers Event Arena. Spacious parking for those who arrive in an RV/trailer or have more than one car. We live on the property so we are available for llama walks and will be on premises to give visitor recommendations for dining and sight seeing. Friendly neighbors with horses and other livestock. Quiet, rural. Near the park and walking trails. Views of the mountains are always changing with the seasons. 20 minute drive to downtown, 10 minute drive for groceries, excellent restaurants and the mall. 10 minute walk to the bus stop. This is glamping (glamorous camping) not a motel or a hotel. However, it has all the amenities of home. A fully equipped kitchen, a dining area, a desk and it's own bathroom. Sleep on our revolutionary and comfy Cordaroy Sleepers (1 queen sized and 2 singles) with pillows, sheets, plenty of blankets. I am a former graphic artist/art director, a fine artist (painter), a roller rink owner and a llamallero (llama wrangler). I have lived in Santa Fe since 1990 and love it here. I fled the cold and snow of Michigan and moved west to Boulder Colorado with my belt buckle business. After being forced out of business by a New York distributor who copied our buckles and manufactured them in Taiwan. I took up design on the Macintosh in 1986 and was told by my fellow artists at the time that real graphics will never be done on a computer. I also took up video production and photography at this time. After about 4 years during the Reagan recession my wife Robbyn and I bought a '73 Winnebago and drove to California where I designed guest guides for some of the most beautiful coastal towns in California. The Mac plus up above the dash board, the keyboard bungied to the steering wheel and the mouse on a little platform to the right. We had great fun selling ads and meeting new people on the road for 2 years. After California we took a 4 month vacation to Santis Pac beach in Baja and painted on the beach. We than came to Santa Fe to be with my step daughter who was living with her dad there while we were on the road. While in Santa Fe I became the art director for the Santa Fe New Mexican. Shortly after that Robbyn and I became New Mexico's first karaoke hosts. After several years all that singing in smokey bars we discovered the local roller rink as a smokeless venue. The minister that ran the rink hired Robbyn to manage the rink while he was running for Congress. We bought the rink from him after he won the election in November of 1996 and have continued to run it to this day. So at the age of 45 I took up roller skating and after 19 years I have gotten pretty good at it. We named the rink Rockin' Rollers and since our first year of operation was 1997 was the 50th anniversary of the Roswell coverup we gave the rink a Rowell Alien theme. We bought the property in 1999. I had been driving past the site from my double wide 13 miles away in La Cienega and wondered why cows were getting such a great view. a couple of years later while looking for property for sale Robbyn discovered that the property was for sale and it turned out to be the very property I had been eyeing for years. We brought our double wide to the property after buying it and put it on a foundation, built porches and stuccoed the whole thing. We then added the llamas starting with 2 girls and a boy which now has grown to a family of 11. I built barns and expanded them as the herd grew. I then built the studio and started painting again. We decided that we needed income property so I designed and built the yurt in 2008. We leased it for 7 years to various adventurous local renters. This spring we began renting it to folks for short term rental and have rented to over 50 people since June. The views of the mountains, the sunsets and the moonrises from the yurts porches and windows makes the yurt special. 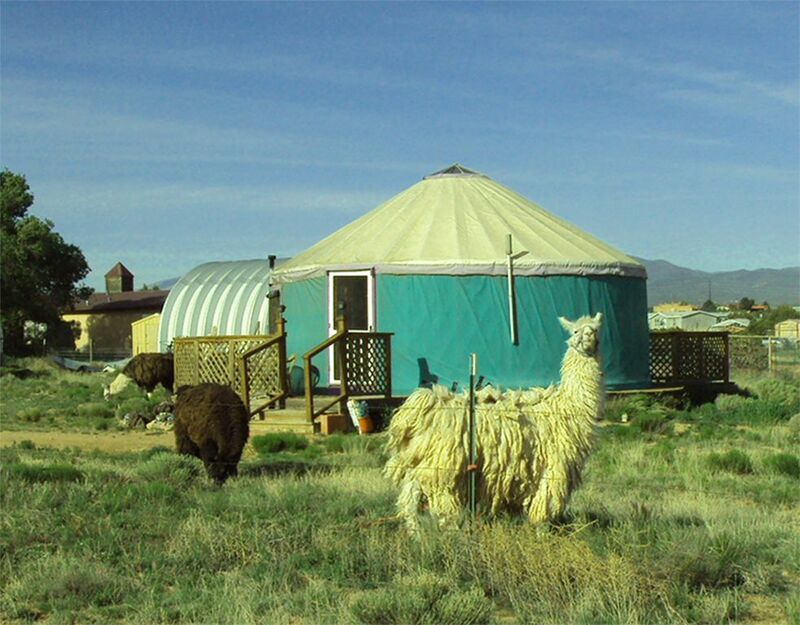 The beauty of the yurt itself and the company of llamas make it a totally unique experience. Our guests are invited to join us on a llama walk down to the nearby scenic Santa Fe River Walk for a small donation to the llama hay fund. If you are a guest on a Friday night you are invited to join us at Rockin' Rollers fee of charge. That offer also includes a slice of my neo-Neapolitan Marguerite cheese pizza. We were looking for a unique place to start our vacation in the Land of Enchantment. This was perfect. Bill welcomed us with chips and salsa, muffins, and most importantly water. We were not familiar with altitude sickness and the information from Bill was priceless. The beds were also unique and I think most people will love them, getting up from them was a challenge for older people like us. The weather did not cooperate so we missed our walk with the llamas. The composting toilet was that but better than trekking out to an outhouse. We enjoyed our stay. We had a great time at the Yurt. I went with my grandmother and mom for a winter road trip, it was so amazing. It was nice, warm, clean, and located in the perfect place for downtown Santa Fe Adventures. We would highly recommend and visit the yurt again. Thank you Iris. So glad you had a good time! We hope that you can come back and see us again from time to time in the coming years! Bill and Robyn are amazing people! I enjoyed every second on their llama farm. The llama walk is a must. Yurt has everything you need. Yurt was cozy and clean. Will definitely be back! Wonderful, unique, and a very nice owner. We had a very nice stay with Bill and the llamas. I think this is a great option for kids - lots of space and its fun to feed the llamas snacks. We were here in early October. Despite the cool nights, the yurt stays warm. Bill is a very gracious host to the young and old alike and want to pass along our thanks for a nice stay. Thank you so much for choosing us for your Santa Fe experience! It is easy to be a good host when you have wonderful guests like you all! Please do come back and see us again. Chewy and Marduk want me to remind you to bring lots of carrots when you do! Our stay in the yurt was pleasant enough, but not without it's disappointments. It's cozy and bright with the shades open, and the llamas are adorable, however the yurt is in need of a good bit of updating/maintenance. The screen doors don't close properly, door handles are wonky, the closet and bathroom bi-fold doors are near useless, I feel the space is in in need of a thorough cleaning. The bedding is not the worst, but it's definitely not for finicky sleepers! I hadn't realized when booking it was fairly close to a major throughway so we could hear highway traffic all night long, and the first night the propane tank ran out so we woke up to a 50/55 degree sleeping space, which is not ideal. Bill was a pleasant and friendly host but we are fairly private when we travel (as far as the space we rent) and we felt he bombarded us with information and random theories about time and space, etc that we simply weren't interested in, and which to be honest made us quite uncomfortable, as if we couldn't have the space to ourselves because he continued to talk to us even after we made it clear we had to leave soon for dinner. Checking in took us almost 40 minutes when it should have taken 10. In terms of view you can't beat it - the sunrise/sunset are great and you can see for miles here. If you're not accustomed to small spaces, this is a great way to try it out as well! We live in a tiny house so the charm of the space did not outweigh the other disappointing factors for us. Overall, I don't want to discourage others from trying this space, I just think it needs some work and the host needs to be more aware of the guests boundaries in the future. I am sorry that you did not enjoy your stay with us. Thank you for your honesty. We enjoyed our recent stay, sleeping among the llamas 6 miles (or so) from the hustle and bustle of Santa Fe. Our hosts, Bill and Robbyn, met us at the door and showed us how it all worked- including the indoor plumbing (pretty luxurious for what is, in fact, a tent). We went to the Opera, hiked in Bandolier, toured Los Alamos (the town, not the Lab) and went to the Santa Fe Indian Market- all easy to reach from our "yurt away from home". Great place, great hosts- give it a try!" Thanks David! We both enjoyed having you and Julie staying with us! We hope that you can come back and see us again soon!